my backpack will be heavier than I expected. I'll have this burning thought at the back of my head that I forgot about something. I'll put in or take something out of my backpack in the very last moment. Of course, the content and size of our rucksack depend on the type and length of my hiking trip. But still, there are some must-haves, no matter how long the hiking trip will last. There's also stuff which isn't obligatory in the mountains but worth to think over. I think balance is everything - I want to prepare well but taking all the possible things which come to my mind or which "may probably come in handy at some point" doesn't work for me. Heavy backpack doesn't really add much joy to my hikes. I always take something warm and something waterproof. No matter if it's nice sunny day - the weather in the mountains tend to change rapidly. Besides, high up in the mountains is usually cold and windy. So, I always take polar fleece jumper or softshell jacket and rain coat. And the gloves - they came in handy so many times that they're now one of my best mountain companions. Summer one-day hike in low mountains is the only exception when I forget about them. I've always got this one with me, no matter how familiar with the area I am - sudden fog takes away all my confidence . Map's light and doesn't take much space - it's a priority when packing my rucksack. I like laminated maps the best - they cope well with wind and humidity. Dry and caloric food is a must in the mountains. We all need often energetic boosts while hiking . If you've got the option to eat in mountain hut, do it. Food served in mountain hostel is expensive but will make your backpack definitely lighter. When it comes to water, enough just isn't enough - dehydration may have fatal consequences . We do need loads of liquids while mountain hiking - much more than on average "city day". I can't afford drinking from the streams (unless I'm very high up in the mountains) so I obediently carry my water. I like sparkling water but choose still for hiking - sparkling drinks may increase our thirst . Oh, and the isotonic drinks - I don't like them very much but often drink them while walking - they hydrate better than pure water. Actually, it's good to add something sweet to your water so that it doesn't get out of you so quickly. Obviously, when it's cold, a hot fruit tea from a flask does wonders. Another essential stuff. When I'm packing my rucksack and see it's already full and heavy, I often try to skip things. So, I'm sometimes tempted not to take headlamp. 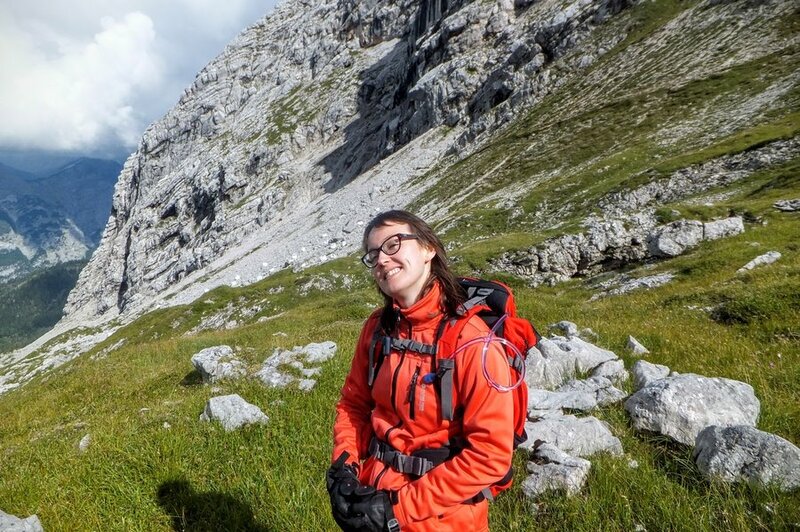 Fortunately, I always say to myself: "Joanna, you never know how long your hike will last . OK, you plan to get to the mountain hut 2 hours before nightfall. But what if you sprain your leg and will crawl slowly? Or admire views for too long? Or you'll simply be tired, have long breaks and night will come unexpectedly? Remember that pitch-dark evening when you were climbing down in Beskidy mountains and could barely see the tip of your nose even with the headlamp on? Come on, take it! It's light and small!". I blow my nose often (especially when I'm active - got no idea why) so can't imagine hiking without them 🙂 They're also my toilet paper. plastic bags (great for separating litter and used clothes from our precious stuff).